Refinishing your hardwood floors will ensure they withstand the test of time, protecting them from any wear and tear your family throws at them. If you’ve been putting this project off due to the price tag, you should know that redoing your floors doesn’t have to cost you a fortune. Sanding and refinishing your hardwood floors as a DIY project is a time investment, but it is less expensive than paying a professional. Refinishing your floors yourself can cost between $500 and $1,000 depending on square footage. You can expect to pay a professional $3 to $4 per square foot to complete the same project. Pro Tip: When refinishing your hardwood floors, you may want to consider staying somewhere else. This project can take more than three or four days. During some stages of the project, you will not be able to step on the floor for at least 24 hours. Before you start, determine what type of flooring you have and what state it is in. Remove a floor air vent and look at the ends of the flooring. If you see solid wood at least ¾ of an inch thick, you’re good to move forward. If you see individual layers of thin wood, this is an engineered floor. Refinishing engineered wood is not a DIY project and you should hire a professional. Place a few drops of water on the floor. If the water beads and doesn’t absorb within a few minutes, your floors are fine. If the water absorbs immediately or within the first minute, it is time to refinish your floors. 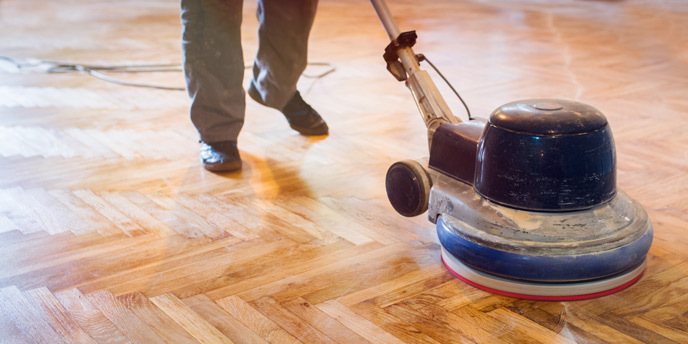 Refinishing a floor requires several tools you probably don’t have on hand. Visit your local hardware store to rent the equipment. When renting the equipment, ask for a demonstration and make sure you know exactly how to work the machine before taking it out of the store. You will also need the correct size of sandpaper and pads for each machine. What grit of sandpaper should you use to sand your hardwood floors? You will need three different levels of sandpaper to complete this project. 30 to 40 grit sandpaper for your first pass. 50 to 60 grit sandpaper for your second pass. 80 to 100 grit sandpaper for your third pass. 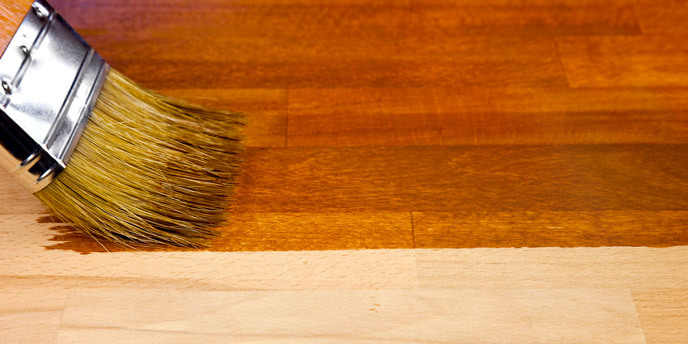 Before you’re ready to refinish your hardwood floors, you must empty the room and thoroughly clean the floors. Start by clearing the room of furniture, curtains and decorations. Remove doors and shoe molding. Removing molding is optional, but it will help prevent damage. If you choose to remove it, use tape to number the pieces and the coordinating wall so you know where each piece belongs. Inspect the floor for any nails that are not flush with the floor. Use the nail set, a small metal tool used for driving nails below the surface of hardwood, to ensure no nail heads are sticking up. Nails not flush with the floor will tear the sandpaper and slow your progress. Repair any existing damage to the floors, like holes or scratches, with wood putty and a putty knife. Clean floors with hardwood floor cleaner. Cover doors, vents, windows and surfaces with plastic sheeting and painters tape. This will prevent dust from traveling throughout your house. Now you’re ready to begin refinishing your hardwood floors. Prepare your sander by attaching the coarsest grit of sandpaper. Position your sander to go with the grain of the wood. If your floor is warped, go diagonal with the grain, but never go completely against the wood grain. Once you’re ready, follow these steps to sand your hardwood floors. Pro tip: Wear a face mask and goggles to protect yourself from the dust and earplugs to protect your hearing. Begin moving the machine forward as you turn it on. If you stay in one place for too long, you will damage the floor. Move at a steady, even pace and let the machine do the work as you follow the grain across the room. Do not push the sander. 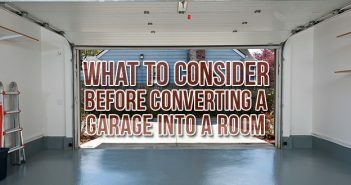 When you get to the other side of the room, move over and pull back slightly overlapping the next pass a few inches with the previous one, about one floorboard’s width. You don’t need to turn the machine around as it can move in both directions with the same effect. Check the sandpaper frequently to make sure it isn’t worn out. Change it as it does wear out, using the same grit of sandpaper until you’ve covered the whole room once. Also, if the sander has a dust collecting bag, empty it often so it doesn’t add weight to the machine. Cover the whole room, getting within a few inches of the walls and corners. After completing one trip around the whole room, turn off the machine before you stop moving. Apply the same grit of sandpaper to the hand sander. Use it to finish the edges of the room. Move in a semicircular motion, overlapping the completed area to help it blend in. Use the vacuum to clean the floor before beginning the second round of sanding. Repeat all steps twice more, changing the grit of the sandpaper each time. Use the 50 to 60-grit for the second pass and the 80 to 100-grit for the third pass. After these steps, the floor should look like smooth, untreated wood. If the floor still feels rough or lines from the sander are still visible, buff it using the sanding screen. This should remove any visible fine scratches left by the sander. After the whole floor feels smooth, clean the room again. This time use the vacuum and a damp mop to ensure no dust is left behind. Use a clean cotton rag to wipe the floor with mineral spirits to remove any trace of chemicals from the wood. Then, leave it to dry. Staining is an optional step. If you’re looking for a trendy dark floor, stain is the way to go. If you want to stick with the natural color of the wood, skip this step and move on to the polyurethane finish. Staining your floor will add at least one whole day to your project time. After selecting a color, try it out on a piece of scrap wood to ensure you like it. Then, follow the instructions on the can. Apply stain with a paintbrush or cloth, going with the grain of the wood. Remove any excess stain with a rag before moving on. Stir your stain every 10 to 15 minutes. Let dry between coats and apply as many coats as needed to achieve ideal color. Pro tip: Do not wear shoes on a recently stained floor. This is the final and most important step when refinishing your hardwood floors. This coating seals your floors and protects them from future damage. If you stained your floors, wait until the stain is completely dry. Next, clean the floors thoroughly with a vacuum. Any dirt, dust or hair on the floor will become trapped under the finishing coat. Polyurethane comes in both water and oil-based types. Oil-based will add a warm golden glow to your floors, but dries slower than the water-based option. Water-based polyurethane will keep the natural color of the wood and also dry faster. You must ensure the room is well-ventilated before applying either one. Wear your facemask during this step as well. Before starting, remove any extra fuzz from the lamb’s-wool applicator. Run the vacuum over it and then use painters tape to get rid of every last piece. Begin by using a paintbrush on the perimeter of the room. Cover about 12 inches of the floor from the wall toward the center of the room. Work in the direction of the wood grain. Keep your brush wet and try to avoid bubbles and drips. Once the perimeter is complete, use the lamb’s-wool applicator to do the rest of the room. Remember to work your way towards the exit, while still applying with the grain. Once you begin to apply the polyurethane, you will not be able to step on the floor. You will want to apply at least two coats, more in highly trafficked areas. Wait 24 hours before completing additional coats. Depending on temperature and humidity, you may need to wait longer. Some brands of polyurethane will require sanding between coats, but others won’t. Consult the container for instructions. If you do sand between coats, be sure to clean thoroughly to get rid of all the dust. Once you’ve completed the desired number of coats, simply wait for them to dry and then you’re done! You can begin walking on your refinished hardwood floors 24 hours after adding the final coat. Wait a week (or as long as possible) before moving furniture back into the room to prevent scratching. Have you refinished hardwood floors before? Let us know how it went in the comments! 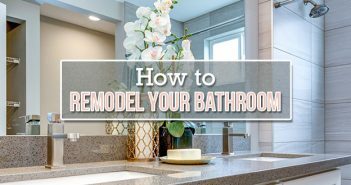 Completing more home improvement projects? 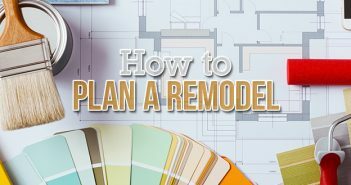 Take a look at our Home Project Guides to learn how to budget for a kitchen remodel, efficiently declutter your home or prepare for a storm. Hi David, thanks for commenting! I will make a note to update the post in order to clarify this step further.